Engineers and reliability professionals are increasingly being held accountable for materials and spare parts inventory management and in response they need to gain a better understanding of materials and spare parts inventory management principles and practices. This practical book delivers just that. This new edition will help you get the right parts, in the right place, at the right time, for the right reason. Fully revised, it provides specific coverage of the issues faced in, and requirements for, managing engineering materials and spare parts and what to do to improve your results. It includes 29 exclusive examples and real life case studies to demonstrate the application of the concepts and ideas so that you will easy and quickly understand how to implement them. What's more it will show you: What to do to truly optimize your inventory holdings, Why inventory levels are almost always too high, How to identifying the factors that have greatest impact on your inventory levels, When to apply the 7 Actions for Inventory Reduction, Where to focus your efforts for greatest effect, and Who to involve in taking action. The concepts, ideas, tools, and processes in this book have helped many companies achieve and sustain results that other inventory tools and approaches just could not match. And it is sure to help you achieve true inventory optimization as well! • A new chapter on The Mechanics of Inventory Management, a pragmatic review of the management of inventory including… Introducing the Materials and Inventory Management Cycle, Comparing theoretical and actual inventory outcomes, Discussion on normal and Poisson distribution models, How to determine the re order point, How to determine the re order quantity, and Commentary on Monte Carlo simulation. • An expanded chapter on the financial impact of inventory, including a discussion of the key reports that need to be understood. • Chapters on the influence of policies, procedures, and people. • Additional discussion on issues faced and how to address them. • An expansion of the central process discussed in the first edition to a more comprehensive review process…Inventory Process™ Optimization. 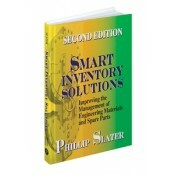 • An expanded section on executing an inventory review program. • A closing 'where to from here' chapter. • 57 figures and diagrams - 30 of them new and the others all revised and updated and six new tables (with 8 in total). • Eight new checklists - specifically included as a new tool for the reader and is the result of direct reader requests. • Where to From Here?